Lowers high blood pressure and cholesterol levels. Improves mood, energy, the skin. There are even those who claim that chocolate can help with weight loss, but of course you have to be really careful with that. Because you NEED to consume healthy fats and nutrients to lose weight in a healthy way, I agree with the concept if rightly understood and applied. I'll deal with chocolate and weight loss in this article after dealing with a number of the basics about chocolate. Cacao is a bean from the pods of theobroma cacao, which you might call the cocoa tree. Like any coffee or grape wines or pretty much any food that's grown, its quality depends on where it's grown and under what conditions. Soil conditions, temperatures, moisture, biodiversity, use or non-use of pesticides and much more can affect the quality of the bean. So a chocolate connoisseur can pick up on many subtle flavors in different types of chocolate, and people enjoy chocolate tasting parties the way they might with wine. In general, though, there are three qualities of cacao bean. These are known as Criollo, Trinitario, and Forastero. Forastero is like "robusta" coffee -- often grown in mass, very common, hearty, but generally without subtle flavors. 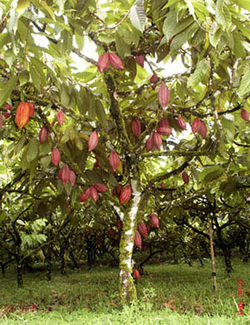 Because of how it's grown, it may not have the same nutrient content as cacao grown in natural forest settings. Criollo is basically your premium bean, very delicate and more difficult to cultivate. It has subtle flavors and is quite expensive. Because it's grown in more natural settings surrounded by biodiversity, it may generally have more nutrients in it. This isn't to say that chocolate tasters only like the taste of Criollo, but that this is a more delicate and very rare (less than 5% of the world's chocolate) bean. Trinitario is a natural hybrid of the two types. Overall, this information doesn't tell you what chocolate you should eat or enjoy, and I don't know that any health studies have separated these out to see which is "healthiest" -- in fact, I suspect that studies are largely done on forastero, since that's what people normally eat. But this will help you to understand at least one reason why some premium chocolates are far more expensive than others -- Criollo costs quite a lot more. Now that you know the basics of cacao, which is used to make chocolate, let's talk about chocolate itself. There are three basic types, modified by all sorts of custom ingredients ... and of course I'm just talking about chocolate bars. There are also truffles, chocolate flavors to just about everything, etc. When cacao beans are processed, they are generally separated into cocoa powder and cocoa butter (no dairy in this!) The cocoa powder seems to offer many of the touted health benefits and antioxidant power while the cocoa butter has much of chocolate's healthy fat. These are combined in different ratios depending on the chocolate you eat. When someone claims "50% cacao" (for example), 50% of the bar comes from the cacao bean, but you don't know if it's in the same ratio of powder / butter that the original bean offered. White chocolate has NO cocoa powder. It is made from cocoa butter, milk, sugar, and other ingredients. Milk chocolate is both cocoa powder and cocoa butter along with milk and sugar. The cocoa content is normally quite low, and those who are interested in the health benefits of cacao generally point out that you're mostly eating milk (possibly spoiled, as is suspected in Hershey's chocolate) and sugar. Some companies use milk substitutes like almond milk to give a milk chocolate experience without the dairy. Depending on regulations, dark chocolate may or may not be allowed to have dairy in it. But chocolate lovers generally agree that dark chocolate should NOT have dairy in it. This leaves cocoa powder / butter and sugar as the main ingredients ... and since sugar is not particularly healthy, the higher the cocoa content, generally the healthier we'd expect the bar to be. In fact, when experts talk about the health benefits of chocolate, they are referring to DARK chocolate with at least a 70% cacao content. And they recommend eating NO MORE than one ounce a day. So when we talk about the expense of choosing better beans or organic or fair trade chocolate (see below), keep in mind that the recommendation is to eat only a little bit a day, and this can still be affordable. On a final note, lecithin is usually used to finish chocolate, and most companies use soy lecithin, though there are options like sunflower lecithin. Some companies don't use any lecithin at all, though this is rare to find. There's growing awareness of organic food, which basically has a number of rules about how it's grown (or raised). The goal is to provide consumers with more pristine food untainted by certain chemicals. It's not a perfect system of course, but eating organic is a good way of minimizing the chemicals you put in your body. It's also supposed to contain NO genetically modified ingredients. Most people can't afford to eat organic all the time, so I encourage choosing organic in products more heavily affected by chemicals, and chocolate is one of those products. That's because cacao has a high fat content and is one of the most heavily sprayed crops when not grown organically. The fat stores these chemicals, so when the cacao is made into your chocolate ... it retains a lot of stuff you really don't want to eat. If a chocolate is 100% organic, this also means that the cacao is not the only thing that's organic. The sugar and other ingredients will be too, and since most include soy lecithin, this means the soy will be organic and non-GMO. Almost all soy that's not organic is genetically modified. So if this concerns you, then organic chocolate is a good choice. There are a lot of ingredients I don't want in my chocolate. But the ingredient I most want to avoid is the sweat of slaves. 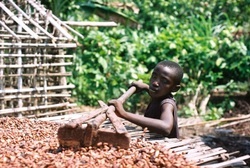 As with coffee and tea, the cacao industry uses a good deal of slavery, including forced child labor. This is especially true of cacao grown in the Ivory Coast. If you want to make sure that you're not supporting slavery, it's best to choose a fair trade label. This certification is meant to prevent slavery and provide farmers with at least a nominal living wage. Some companies are more committed to supporting their farmers than others, and will contribute to local education, health, etc. And if you see the "Direct Trade" label, this means that a company is working directly with farmers rather than through distributors. In this case, farmers can be paid far more for their crop and they can do much better for themselves and their families, often without raising the price much at all for the end consumer. As with organic, the labeling process may not be perfect, but nothing human is. Some certifications are probably more thorough than others. But without going into great depth on this one topic, I just recommend being aware of this issue and using your wallet to vote for slave free products. Though there is no legal definition of raw chocolate, many in this field define it as chocolate that's been made from cacao processed below about 115 degrees Fahrenheit. The concept to eating raw food in general is the belief that it retains more of its natural enzymes and other nutrients. There's a whole movement around this idea, and I do enjoy raw chocolate. And it does seem to provide more of a kick than cooked chocolate. Contrary to this movement, though, we know that some nutrients are brought out through cooking. There is also a concept in Chinese medicine about food being too "hot" or "cold," and eating all raw foods can cause problems due to too much cold. Chocolate itself, however, is considered a "hot" food, which I personally suspect is true even when it's raw. Another challenge in this area is that chocolate is usually made under secrecy to prevent the stealing of recipes or processes. As a result, it's difficult to know if someone's chocolate is truly raw. I'm only currently aware of one company that is completely transparent about how they make their chocolate, and I'll talk about them below. What I do know is that raw chocolate companies often make their products by hand, they usually use organic and fair trade ingredients, they often include a number of additional, premium health ingredients, and more. From what I've seen, there's a lot of integrity in these companies, and I like supporting that. Be aware, however, that raw chocolate runs about 2-4 times more expensive than cooked organic chocolate -- typically about $3 to $4 per ounce. Yes, it's a premium product. People sort of joke that they can eat chocolate as part of diet because it's really a fruit. Well as I explained, that's not too far from the truth. Cacao is a bean that grows in a pod on a tree, and it's loaded with nutrients. Although it's high in fat, this isn't unhealthy fat -- but it does need to be consumed in moderation. Still, experts recommend no more than one ounce of dark chocolate (70% cacao or more) per day. So I suggest finding a healthy chocolate and consuming small amounts as a way of satisfying a craving for something sweet. If you can stick to one ounce a day or less AND successfully use healthy chocolate to prevent you from eating other sweets, I believe it can truly assist in your weight loss efforts. Having said this, if you're looking for the best weight loss success when eating chocolate, you might consider chocolate with additional ingredients that support healthy weight loss. I'll talk about these below as I share a few chocolate companies. As a point of transparency, links to products are affiliate links or links to my own store. 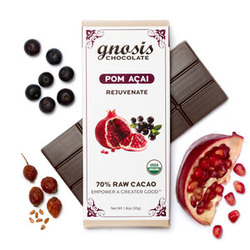 Gnosis Chocolate is the first raw chocolate company I discovered when I began investigating healthy chocolate. Actually, I first saw them in a magazine article, then got to know them and their chocolate, and I've been a fan ever since. One of my favorite things about them is their transparency. There may be other companies doing things in a similar way, but so far they're the only ones I've seen showing videos demonstrating how they process the beans at a low temperature. Founded Vanessa Barg also has videos of her visiting the farms that she trades with directly, has investigated her sweeteners in depth to make sure they are processed in a healthy way, etc. So as a consumer, you can really trust the product you receive from them. Gnosis Chocolate has a fudge-like quality to it -- not the traditional snap of cooked chocolate, but also not the chewy feel of some raw chocolates. 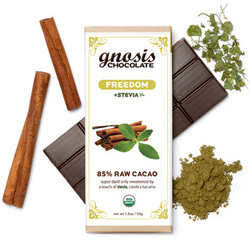 To me, it also has its own unique chocolate taste, and the bars are loaded with incredible superfoods. Some of their flavors are hidden, and some are there specifically to enhance the experience. One of favorites (pictured here) is Pom(egranate) Acai -- wow, what a dessert! Another bar worth noting is Freedom -- sweetened with Stevia, so it's perfect for diabetics or anyone who's concerned about sugar. It's also an extra dark chocolate (85% cacao) and, as all the bars, it's enhanced with many nutritional ingredients. A final point worth Gnoting ... (ahem) is that they DO have some raw chocolate bars that have a more traditional chocolate snap and flavor. These are their premium Originib bars -- each features a bean of a particular regional origin, and the tastes are fantastic. Even if you can't afford to eat these often, I feel they're worth trying once or enjoying on special occasions. This is another chocolate I've gotten to know over the years as they've gone through different formulations and improved not only the taste but also certified the chocolate as organic and fair trade. Note: it is NOT raw chocolate. And remember, most if not all of the health studies on chocolate have been on cooked chocolate. Tru Chocolate's claim to fame is that it is made with xylitol (from birch trees) rather than sugar. Xylitol is known to actually support the health of your teeth and may have other health benefits while definitely satisfying a sweet craving. Most importantly, xylitol has a low glycemic load so this is an ideal chocolate for diabetics or those concerned about blood sugar levels. Xylitol does taste different, though, which is why Tru Chocolate has worked on its formula over the years; they've now reached the point where they've gotten exceptionally positive feedback regarding the flavor, and when I shared this chocolate (including their chocolate covered snacks) with some friends, I got some great comments as well.